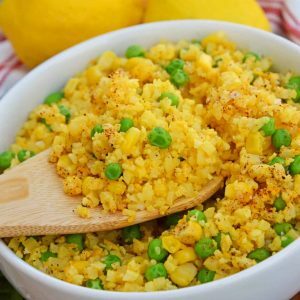 Mexican Cauliflower Rice is a healthy cauli-rice with zesty spices, shredded cheese and a twist of lemon. The perfect low-carb Mexican side dish! In a small bowl, combine garlic powder, turmeric, fine sea salt and coriander. Set aside. Toss cooked cauliflower rice with vegetable oil and lemon juice. Add dry spice mix, tossing to coat. Toss in cheddar cheese cooked peas and corn. Try to toss the mixture instead of stirring to prevent the mixture from getting mushy.